Hawkesbury trainer Brad Widdup and country riding ace Greg Ryan joined forces for the first time at Bathurst on Monday – and enjoyed immediate success. Widdup’s victory with recent acquisition Battle Fury ($2.70 joint favourite) in the Maiden Plate (1408m) gave him his fifth win of the season and kicked off a treble for Hawkesbury trainers on the seven-race program. Karen Outtrim and Garry Frazer notched their opening wins of the season by scoring with Captain Americain and Sweet Fella respectively. Widdup clinched his second winner in six days for Darby Racing, having scored with Invictum Domina at Warwick Farm last Wednesday. He now prepares five horses for the syndicators of last year’s Golden Slipper winner She Will Reign. Ryan’s wife Pauline, who manages the bookings for her husband, rang Widdup for the mount on Battle Fury – and circumstances permitted him to accede to the request. “Pauline has rung several times before seeking rides for Greg, but I have always had either my brother-in-law Christian Reith or our apprentice Qin Yong available,” Widdup explained. “Christian was busy at Warwick Farm trials this morning and this was a good opportunity to get Greg to ride for me for the first time. Widdup, meanwhile, was delighted with the performance of his talented three-year-old Sandbar when fourth to The Autumn Sun in last Saturday’s $1m Group 1 Golden Rose Stakes (1400m) at Rosehill Gardens. “Sandbar ran a terrific race. The three colts that beat him home are rippers,” he said. “He gives his all every time and has done a terrific job for us. Outtrim was thrilled with her four-year-old Captain Americain’s dominant victory in the Class 1 Handicap (1808m). The son of 150th Melbourne Cup winner Americain in 2010, the former Queenslander left his rivals with no excuses. With Bobby El-Issa aboard, Captain Americain ($3.80) burst between runners in the straight and cleared out to trounce Stately Boy ($10) and Heeby Frenly ($81). It was a case of lightning striking twice for Frazer with Sweet Fella ($10), whom Hawkesbury apprentice Brandon Griffiths brought with a determined finish to land the Benchmark 58 Handicap (1208m). 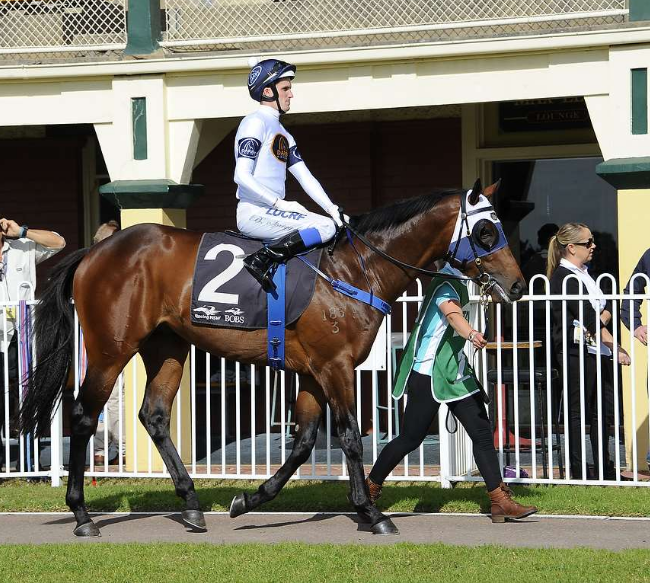 Frazer freshened the six-year-old and won first-up with him at the same track in January in a 1300m Class 2 Handicap (when ridden by Griffiths’ partner, fellow apprentice Chelsea Ings), and readied him for this assignment with a barrier trial hit-out at Hawkesbury on August 14. “He trialled well and the field he met today was weaker than that he beat earlier in the year,” Frazer said. Frazer understandably hoping it is the start of a big week for the stable as he saddles Spright (Damien Oliver), who, like Sweet Fella, begins a new campaign in Friday night’s Group 1 Moir Stakes (1000m) at Moonee Valley. Bathurst has long been a happy hunting ground for Hawkesbury trainers. Monday’s treble lifted to 15 winners this month (and 25 overall so far this season) on all tracks for Hawkesbury-trained horses.